An easy canape to serve with champagne. 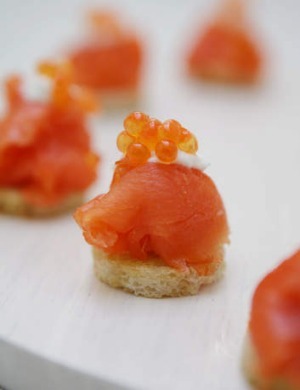 Other ingredients that go really well with smoked salmon and can be incorporated into these canapes - by either mixing into the sour cream or creme fraiche, using as a garnish on top or substituting for the toast - include dill, capers, boiled and finely chopped eggs, cucumber, chives, lemon and beetroot. *Salmon roe is sold at many fishmongers. Spread each toast with a little sour cream or creme fraiche. Cut slices of smoked salmon in half and twist around your finger to fit neatly on top of toast and achieve some height. Place a small dollop of sour cream on top and garnish with salmon roe. Season with white pepper and sea salt.